Last Thursday I was lucky enough to be invited to the eagerly anticipated Irish launch of the Coravin wine preserver. And yes, that eager anticipation really only applies to gadget-gawping anoraks such as yours truly. I have to admit, new wine toys hold me in a similar thrall that a piece of tin foil will lord over a magpie on a sunny day. Corkscrews and preservers, aerators and stoppers, gizmos and gadgets; you name them, I have them. If I spent as much money on wine I’d drink nothing but First Growths! The launch was hosted by Greg Lambrecht, the brain behind Coravin. Educated as a nuclear physicist at MIT, Greg’s background is in the medical field- inventing precise instruments to improve surgical techniques. He brought these same skills to a problem he perceived with wine preservation. Namely, once a cork is pulled on a bottle of wine, it has to be consumed relatively quickly or oxidate. This became a particular problem when his wife was pregnant and he simply wanted a glass over dinner. How can you have one glass of wine without wasting the rest of the bottle? Other preservers do exist, but they all necessitate the pulling of the cork, so don’t work indefinitely. Greg believes cork and glass are ultimately the best preservers, so in 1999 decided to work on a wine preserver that leaves the cork in place, allowing the wine to develop naturally. 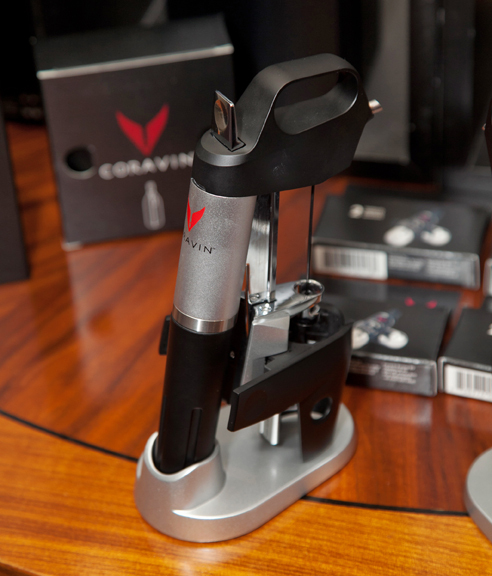 After much trial and error and over 2,000 bottles of wine later, he released the Coravin 1000. The Coravin works by inserting a small, teflon-coated non-coring needle through the cork and forcing inert Argon in to the bottle. The pressure exerted by this gas forces wine back up through the needle and in to your glass. The natural elasticity of cork means the hole will close quickly once the needle is removed and the Argon, which is heavier than air, will prevent oxygen from coming in contact with the wine. It’s a wonderful piece of engineering, but I did have one major reservation. As you are forcing gas in to a closed system, what are the chances of the bottle bursting in your hand? Apparently there have been a few cases of this happening and caused Coravin production to be suspended. However, each bottle that did shatter was already damaged and we were told the chances are roughly 1 in 70,000 of this happening. Not perfect, but considering they are longer odds than being killed in a workplace accident, I suggest you swiftly quit your job and stay home drinking wine! I have to admit I was hooked by the engineering and relative simplicity, as well as ease of use, of this nifty little gadget. But before you go running out to buy one, make sure you have €299 in your back pocket. And that’s just the initial cost. Once the Argon gas canister expires, after about 15 uses, they are €10 each to replace. As well as the cost, it does not work on screw cap or sparklers and has limited effectiveness with synthetic corks. So, it does have limitations for home use. However, in the on-trade it should prove a game changer. It will allow restaurants and bars to offer a much wider range of wines by the glass. A decent selection of dessert wines, an area where Ireland is sorely lacking, should become more prevalent on lists also. Since its launch in Britain in September, over fifty bars and restaurants in London alone have adopted its use. And here, The Shelbourne Hotel and Chapter One have already embraced the Coravin. Hopefully the rest of the Irish trade will see the potential and quickly follow suit. I was kindly offered my own Coravin to try at home, so will test it over the coming months and write up a report on my findings. The Coravin 1000 is distributed by Findlater Wine and Spirit group and is stocked in select O’Briens off-licences.